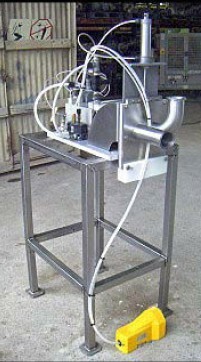 Sircy Packaging Inc. 1 Gallon Volumetric Piston Filler Model: P-5. S/N: 89-003. (1) ARO foot pedal switch. Inlets/outlets: (2) 2-1/2 in. S-Line. Overall dimensions: 2 ft. 10 in. L x 1 ft. 9-3/4 in. W x 4 ft. 11 in. H. Unit has been tested and is in Good Operating Condition. Delivery: 1-2 weeks from receipt payment.